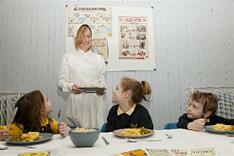 School catering provider Cordia has set up taster-stations in the city's primary schools to give pupils a taste of what school meals were like 100 years ago during the war. Glasgow primary pupils have been taken out of their comfort Fuel Zones and transported back in time to get a flavour of school dinners served to children during the First World War. 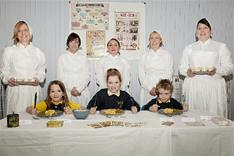 School catering provider Cordia has set up sample stations at each of the city's 138 primaries to give children a taste of the typical meals available to pupils during the war. During the sessions, set up during the normal lunchtime break, the pupils were given the option to try a main meal of cheese and potato flan served with peas and a pudding of baked rice. Cordia has also printed posters for each school to highlight the changes in catering between 1914 and 2015, showing contrasting images of the dining and kitchen areas, the typical meals served and even the uniforms worn by staff. Julia McCreadie, Cordia's head of Encore and facilities management, said: "Our previous projects, such as the school crossing patroller poppy armbands and the lunch honouring Glaswegians born between 1914 to 1919, were designed to commemorate the First World War. "The school meal sample sessions have also been introduced to commemorate the centenary, but we hope they will also help educate today's pupils about what school life was like during the First World War." 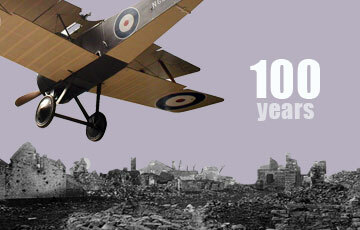 The First World War sample lunch is just one of many projects to be undertaken by Cordia and other city council ALEOs to help commemorate the centenary and duration of the First World War over the next four years.